You can see for yourself how the western cast look nothing like the Anime character she try to imitate. It seems the big majority of hollywood movie studio are still fulls of racist and retards, racist because they use western cast to imitate Asian characters while retarded because there is no possibily for westerners to be able to look like characters made based on Asians such as Anime characters. We say 'the big majority' because there seems to be some hollywood movie studio this days who have learn from their previous mistakes of using western cast when making Anime live action, one of them is warner bros who currently make a Gintama live action that will be released in 14 July 2017 where they now use the correct cast. 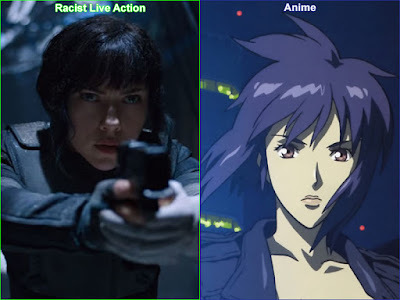 Anyway, if you are an Anime fan especially a GITS fan who are angry at what the hollywood movie studios doing then you should take the poll 7 Reasons why peoples hate western cosplayers to show the racist and retards in hollywood that Anime characters are based on Asians so that those racist and retards will eventually stop ruining Anime.